There are 2 REITs that originate from China recently. One of them is BHG Retail REIT and the other, is EC World REIT. BHG Retail REIT reports their latest quarter result and they provided a very thorough slide deck to update investors. When they IPOed, the price was at $0.80. It stayed there for a while, before falling to $0.59 recently. The forecast dividend yield then was 6.3%, or if we worked backwards, the forecast dividend per share is $0.80 x 0.063 = $0.05. The interesting thing about BHG Retail REIT is that my friend tells me there are financial engineering. Where is the Financial Engineering? The question is where is the financial engineering? I sought to try my luck, to kill some of my brain cells to see if I can spot this in the latest quarterly financial results. 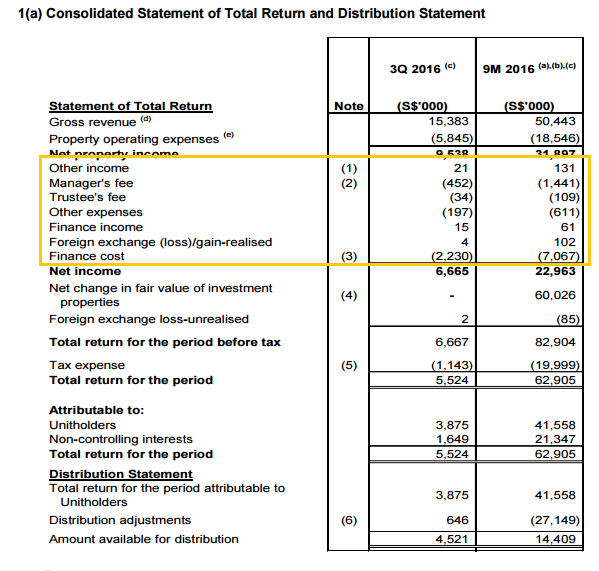 I first take a look at the Statement of Total Return and Distribution Statement, which reports the revenue, net property income, net income. Typically, if a REIT manager or sponsor provides some form of income support, it should show up in the line items after net property income. I don’t see much out of the ordinary here. 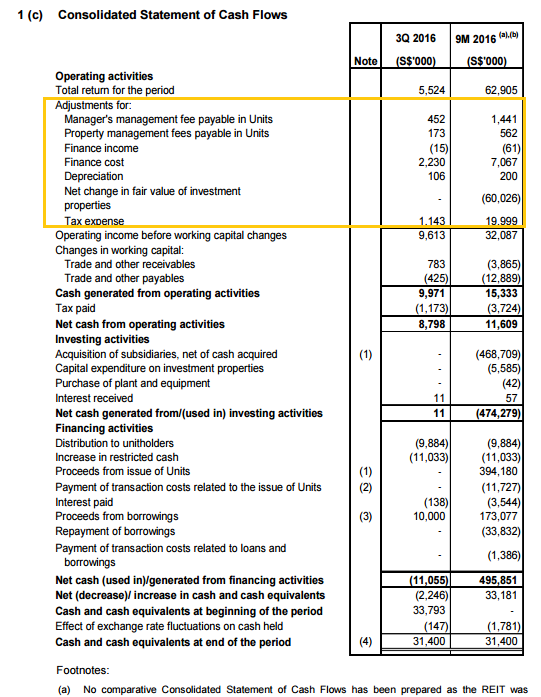 A check of the footnotes (not seen here) does not indicate anything out of the ordinary except for why a lower revenue will eventually lead to a higher net income. This is due to the same change in VAT tax from the old Business Tax regime in the China Tax Reform I mentioned in my MGCCT tear down. 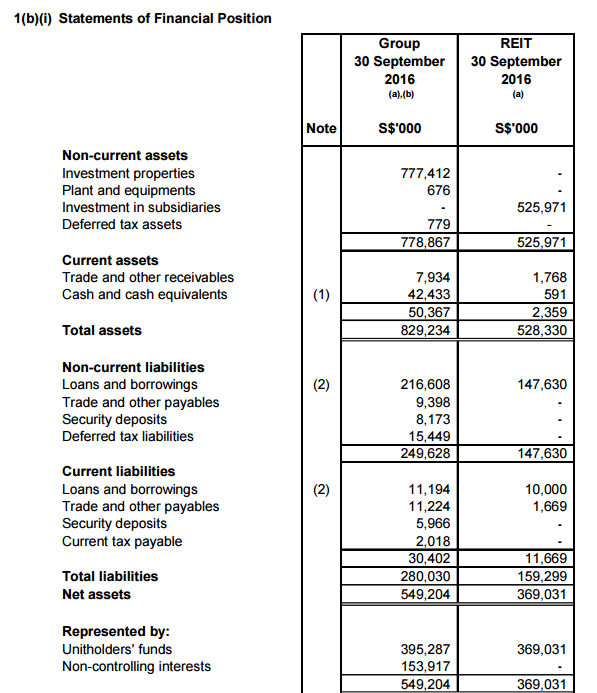 As mentioned in my MGCCT post on how to read a quarterly financial statement, there are additions and subtractions to the net income, to arrive to an amount that shows the Income Available for Distribution. In this case, there don’t seem to be any income support shown here. For sure, one form of financial engineering are managers paying themselves with units, instead of cash, which allows them to justify a dividend yield with available income, by not paying themselves. However, many managers are doing this, so its not all that surprising. 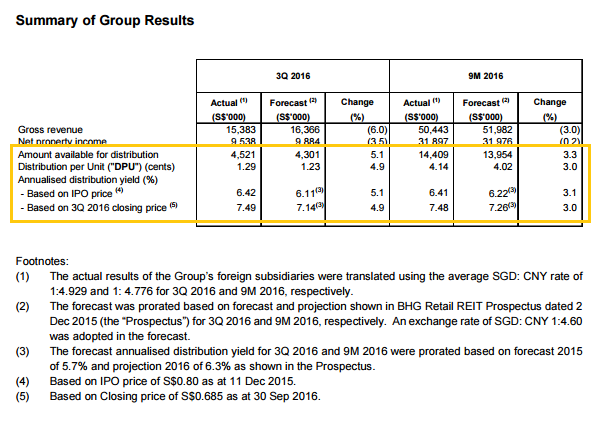 Plus BHG Retail REIT’s number is rather small. Could it be seen in the Statement of Cash Flows? Usually if there are some form of support, it could show up at the adjustments to operating activities, which I put an orange box. It could perhaps show up as some form of shareholder loan from subsidiary in the Investing Activities. This doesn’t seem to be the case. Neither do I see that BHG REIT trying to capitalize the rent as some form of dividend payable in the liabilities, which is like owners lending money to the REIT for cheap. I couldn’t find it in the end. And my friend pointed out to me. In the summary of group results, we see that for the quarter the Distribution per Unit is 1.29 cents. The Amount available for distribution is $4.5 mil. Based on IPO price of 80 cents the distribution yield is 6.42%.Hold these numbers. You can get the total number of units issue in a few places. You can find it where they compute the earnings per share and also net asset value per unit as above. we see that BHG Retail REIT issued 495 mil shares. 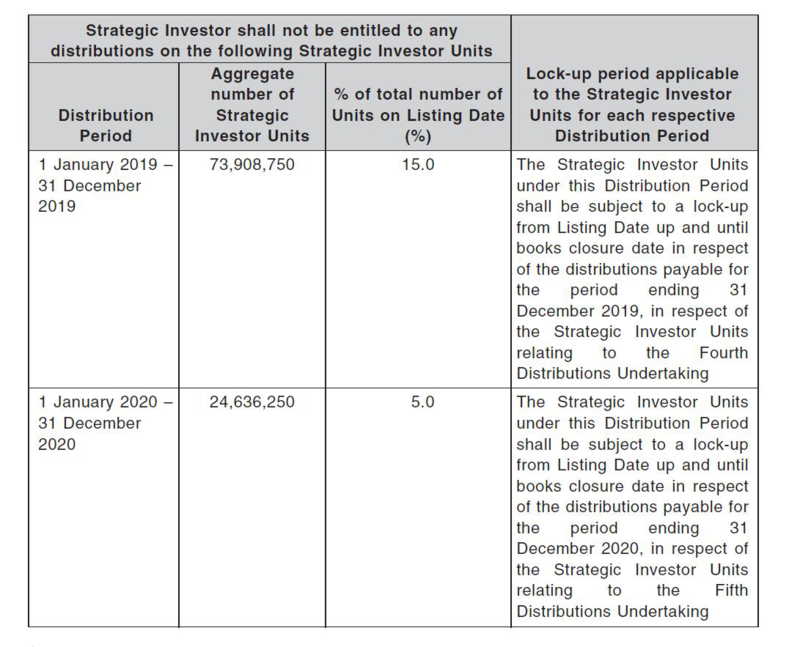 If we take the Amount Available for Distribution $4.5 mil divide by 495 mil in shares, the amount available for distribution per share is 0.9 cents. Suppose we annualized this quarterly amount, we get 3.6 cents. The dividend yield based on the IPO price of 80 cents is 4.5%. How come so low versus the 6.42% that was actually distributed? 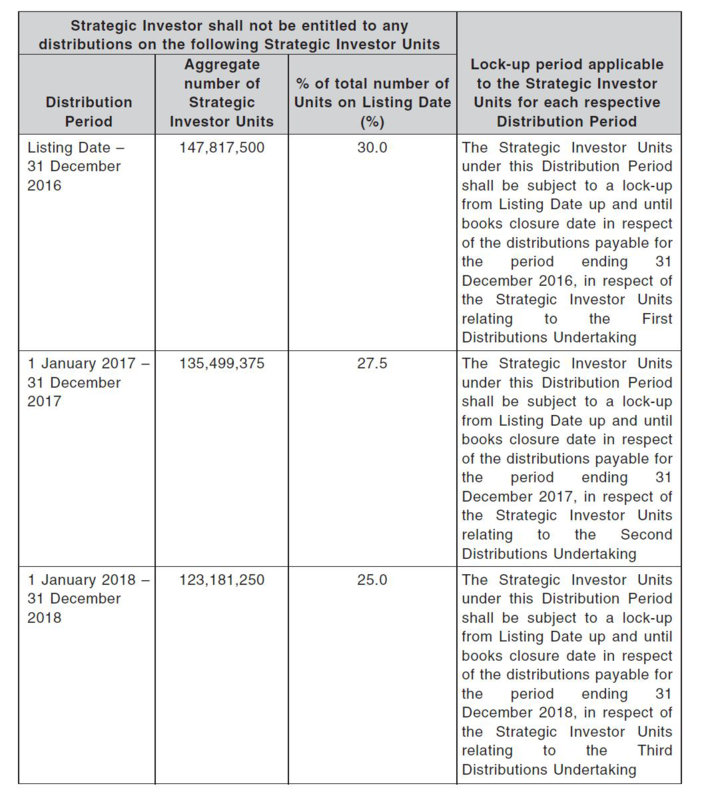 It turns out that their strategic investor are not being paid dividends during this period. Due to that, the income available for distribution gets spread out to you, the investor, and thus the ability to pay 6.42% dividend yield. For the next 5 years, the strategic investor will be able to slowly earn more dividends, but starting off, they will not be entitled to the dividends. I wasn’t able to spot this, probably because I did not see what is the income available for distribution per unit. Even if I did, I think I would have dismissed that figure as an error on my part. The above information was taken from the prospectus and it will be very difficult to spot. A learning lesson here for me. your headline is totally misleading, i suggest you educate yourself what financial engineering is. financial engineering is the study of financial assets, markets or risk through financial modelling and quantatitve analysis and statistics, you can label the title whatever you want but please don’t use jargons that you don’t understand. Nothing wrong with the title here. Anyway why quibble over semantics? It’s the content that matters. Hi Goh, thanks for highlighting that. I have to admit I was so used to this term which is also by the media that I failed to realize it might be the wrong term. hi berg.trader, thanks for educating me. I do not know what terms to use, but those folks around me, they either use this or income support. It is not based on some form of organic income production that is sustainable. Temasek Holdings chief executive Ho Ching has warned against “clever financial engineering” aimed at boosting short-term performances of real estate investment trusts (Reit). night to mark Mapletree Logistics Trust’s first day of trading. is guided by the integrity of Reit managers, and supported by savvy regulators and active stakeholders. “As reits are supposed to be about steady income returns, they commonly use financial engineering to boost the yields at the time of IPO marketing to make the offer as attractive as possible to investors. BHG Retail Reit uses a sponsor waiver, a kind of financial engineering, to artificially inflate the yield, and market commentators have raised concerns over whether the yield may tumble once that support is removed. This may or may not be financial engineering but it sure is sneaky! Thanks for pointing it out! Hi J, I was looking forward to see how it is, after forgetting the original IPO idea. Guess I am still not good enough. 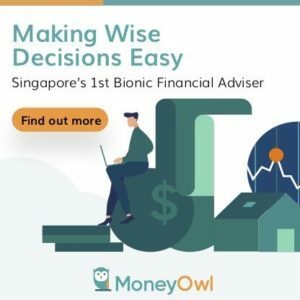 I note the Motley Fool SG had written about this same issue in an article from that time. Sometimes you can also check out what others say … that is the beauty of being part of an investing community. hi Stephen, you guys are part of my community as well. That is why i remember there are form of income support but want to test myself to see if I can find it. apparently not good enough! I got that by googling. I guess in the local context, the term “financial engineering” seems to have a negative connotation to it. I’m not sure if what you pointed out actually constitutes “financial engineering”… but it sure as hell is something good to know if you’re one of the unit holders! Hi TTI, its very intuitive that I use it because I hear a lot of it. I did some look up after this and apparently its used in real estate books as well. I probably will share some more income support or interest swap stuff after this. Just wondering if this ‘income support/fin engineering’ is any different from what other REITs have done? E.g. 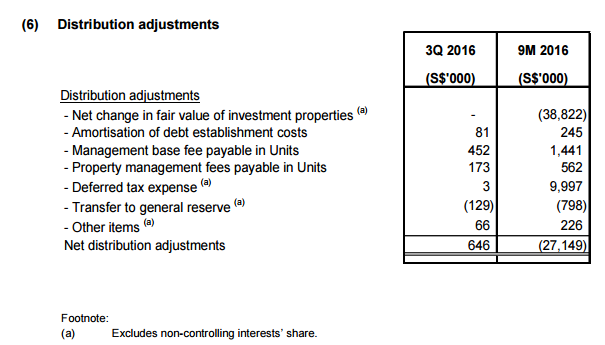 OFC injection into K reit which if I remember correctly could be termed real ‘income support’ since higher rent is being provided to K-reit. In this case, it is the sponsor choosing not to take dividends. Is this similar? Hi Jason, thanks for sharing. I would term that as well. CMT also did it for one of their retail acquisition. that is seldom mentioned. financial engineering is not always bad, its that it is something we need to watch out for when assessing attractiveness. In construction, the term is ‘value engineering’.